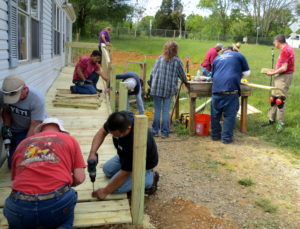 For the past 22 years, Mountain Housing Opportunities and volunteers from the community have spent several weekends in late spring building wheelchair ramps for low income people in Asheville and Buncombe County. 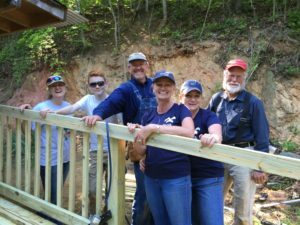 This year’s Ramp Festival was held on May 7th and three handicap ramps were built with volunteer help from employees with Eaton Corporation, Liberty Baptist Church, and the Mortgage Bankers of Western North Carolina. Teresa is 62, has had a knee replaced and also suffers from diabetic neuropathy and other medical conditions. She now has easy access to her car to travel to doctor’s appointments. Benny is 67 years old and lives alone. He has suffered from lung, liver and bone cancer and has a hard time navigating the stairs on his back porch. Benny now has a ramp that gives him a safe way to come in and out of his home. Deborah is 60 and requires a wheelchair and oxygen. She also suffers from diabetes, kidney disease, and congestive heart failure. Her existing ramp had rotted and she had no clear way to exit her home safely. Deborah now has a secure handicap ramp that gives her the freedom and access she needs to come and go without the fear of falling. 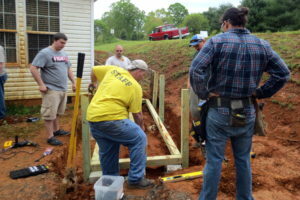 For more information about Mountain Housing Opportunities, call 828-254-4030, or visit www.mtnhousing.org.